"If you say that again I'll go and tell Mr. Bhaer all about it. I don't want to tell tales, but, by George! I will, if you don't let Dan alone." "Then you'll be a sneak, as well as a liar and a thief," began Ned, with a jeer, for Nat had borne insult to himself so meekly, the other did not believe he would dare to face the master just to stand up for Dan. What he might have added I cannot tell, for the words were hardly out of his mouth when a long arm from behind took him by the collar, and, jerking him over the wall in a most promiscuous way, landed him with a splash in the middle of the brook. "Say that again and I'll duck you till you can't see!" cried Dan, looking like a modern Colossus of Rhodes as he stood, with a foot on either side of the narrow stream, glaring down at the discomfited youth in the water. "I was only in fun," said Ned. "You are a sneak yourself to badger Nat round the corner. Let me catch you at it again, and I'll souse you in the river next time. Get up, and clear out!" thundered Dan, in a rage. Ned fled, dripping, and his impromptu sitz-bath evidently did him good, for he was very respectful to both the boys after that, and seemed to have left his curiosity in the brook. As he vanished Dan jumped over the wall, and found Nat lying, as if quite worn out and bowed down with his troubles. "He won't pester you again, I guess. If he does, just tell me, and I'll see to him," said Dan, trying to cool down. "I don't mind what he says about me so much, I've got used to it," answered Nat sadly; "but I hate to have him pitch into you." "How do you know he isn't right?" asked Dan, turning his face away. "What, about the money?" cried Nat, looking up with a startled air. "But I don't believe it! You don't care for money; all you want is your old bugs and things," and Nat laughed, incredulously. "I want a butterfly net as much as you want a fiddle; why shouldn't I steal the money for it as much as you?" said Dan, still turning away, and busily punching holes in the turf with his stick. "I don't think you would. You like to fight and knock folks round sometimes, but you don't lie, and I don't believe you'd steal," and Nat shook his head decidedly. "I've done both. I used to fib like fury; it's too much trouble now; and I stole things to eat out of gardens when I ran away from Page, so you see I am a bad lot," said Dan, speaking in the rough, reckless way which he had been learning to drop lately. "I won't say any thing about it. But don't you fret, and we'll pull through somehow, see if we don't." "I think you know who did it. If you do, beg him to tell, Dan. It's so hard to have 'em all hate me for nothing. I don't think I can bear it much longer. If I had any place to go to, I'd run away, though I love Plumfield dearly; but I'm not brave and big like you, so I must stay and wait till some one shows them that I haven't lied." "You won't wait long," and he walked rapidly away, and was seen no more for hours. "You think I am getting on, don't you?" "Excellently, Dan! and I am so pleased, because I always thought you only needed a little help to make you a boy to be proud of." He looked up at her with a strange expression in his black eyes an expression of mingled pride and love and sorrow which she could not understand then but remembered afterward. "I'm afraid you'll be disappointed, but I do try," he said, shutting the book with no sign of pleasure in the page that he usually liked so much to read over and talk about. "Are you sick, dear?" asked Mrs. Jo, with her hand on his shoulder. "My foot aches a little; I guess I'll go to bed. Good-night, mother," he added, and held the hand against his cheek a minute, then went away looking as if he had said good-bye to something dear. "Poor Dan! he takes Nat's disgrace to heart sadly. He is a strange boy; I wonder if I ever shall understand him thoroughly?" said Mrs. Jo to herself, as she thought over Dan's late improvement with real satisfaction, yet felt that there was more in the lad than she had at first suspected. "I don't wish to hurt you, Nat, but you see I can't afford to lose my money, so I guess we won't be partners any longer;" and with that Tommy rubbed out the sign, "T. Bangs & Co."
Nat had been very proud of the "Co.," and had hunted eggs industriously, kept his accounts all straight, and had added a good sum to his income from the sale of his share of stock in trade. "O Tom! must you?" he said, feeling that his good name was gone for ever in the business world if this was done. "I must," returned Tommy, firmly. "Emil says that when one man 'bezzles (believe that's the word it means to take money and cut away with it) the property of a firm, the other one sues him, or pitches into him somehow, and won't have any thing more to do with him. Now you have 'bezzled my property; I shan't sue you, and I shan't pitch into you, but I must dissolve the partnership, because I can't trust you, and I don't wish to fail." "I can't make you believe me, and you won't take my money, though I'd be thankful to give all my dollars if you'd only say you don't think I took your money. Do let me hunt for you, I won't ask any wages, but do it for nothing. I know all the places, and I like it," pleaded Nat. But Tommy shook his head, and his jolly round face looked suspicious and hard as he said, shortly, "Can't do it; wish you didn't know the places. Mind you don't go hunting on the sly, and speculate in my eggs." Poor Nat was so hurt that he could not get over it. He felt that he had lost not only his partner and patron, but that he was bankrupt in honor, and an outlaw from the business community. No one trusted his word, written or spoken, in spite of his efforts to redeem the past falsehood; the sign was down, the firm broken up, and he a ruined man. The barn, which was the boys' Wall Street, knew him no more. Cockletop and her sisters cackled for him in vain, and really seemed to take his misfortune to heart, for eggs were fewer, and some of the biddies retired in disgust to new nests, which Tommy could not find. "They trust me," said Nat, when he heard of it; and though the boys shouted at the idea, Nat found comfort in it, for when one is down in the world, the confidence of even a speckled hen is most consoling. "It might turn out that Nat didn't take my money, and then we could be partners again. I don't think it will happen, but I will give him a chance, and keep the place open a little longer." "It gets worse and worse; I never saw such provoking old hens," growled Tommy, thinking of the days when he often had six to rejoice over. "Well, put 'em in my hat and give me a new bit of chalk; I must mark 'em up, any way." Billy mounted a peck-measure, and looked into the top of the machine, where Tommy kept his writing materials. "There's lots of money in here," said Billy. "No, there isn't. Catch me leaving my cash round again," returned Tommy. "I see 'em one, four, eight, two dollars," persisted Billy, who had not yet mastered the figures correctly. "What a jack you are!" and Tommy hopped up to get the chalk for himself, but nearly tumbled down again, for there actually were four bright quarters in a row, with a bit of paper on them directed to "Tom Bangs," that there might be no mistake. "Thunder turtles!" cried Tommy, and seizing them he dashed into the house, bawling wildly, "It's all right! Got my money! Where's Nat?" He was soon found, and his surprise and pleasure were so genuine that few doubted his word when he now denied all knowledge of the money. "How could I put it back when I didn't take it? Do believe me now, and be good to me again," he said, so imploringly, that Emil slapped him on the back, and declared he would for one. "So will I, and I'm jolly glad it's not you. But who the dickens is it?" said Tommy, after shaking hands heartily with Nat. "Never mind, as long as it's found," said Dan with his eyes fixed on Nat's happy face. "Well, I like that! I'm not going to have my things hooked, and then brought back like the juggling man's tricks," cried Tommy, looking at his money as if he suspected witchcraft. "We'll find him out somehow, though he was sly enough to print this so his writing wouldn't be known," said Franz, examining the paper. "Demi prints tip-top," put in Rob, who had not a very clear idea what the fuss was all about. "You can't make me believe it's him, not if you talk till you are blue," said Tommy, and the others hooted at the mere idea; for the little deacon, as they called him, was above suspicion. Nat felt the difference in the way they spoke of Demi and himself, and would have given all he had or ever hoped to have to be so trusted; for he had learned how easy it is to lose the confidence of others, how very, very hard to win it back, and truth became to him a precious thing since he had suffered from neglecting it. "Why, it's the book Uncle Teddy gave Dan!" "The devil!" broke from Dan, for he had not yet quite cured himself of swearing, though he tried very hard. Mr. Bhaer looked up quickly at the sound. Dan tried to meet his eyes, but could not; his own fell, and he sat biting his lips, getting redder and redder till he was the picture of shame. "What is it?" asked Mrs. Bhaer, anxiously. "I should have preferred to talk about this in private, but Demi has spoilt that plan, so I may as well have it out now," said Mr. Bhaer, looking a little stern, as he always did when any meanness or deceit came up for judgment. "The note is from Mrs. Bates, and she says that her boy Jimmy told her he bought this book of Dan last Saturday. She saw that it was worth much more than a dollar, and thinking there was some mistake, has sent it to me. Did you sell it, Dan?" "Yes, sir," was the slow answer. "To whom did you owe it?" "Never borrowed a cent of me in his life," cried Tommy, looked scared, for he guessed what was coming now, and felt that on the whole he would have preferred witchcraft, for he admired Dan immensely. "Perhaps he took it," cried Ned, who owed Dan a grudge for the ducking, and, being a mortal boy, liked to pay it off. "O Dan!" cried Nat, clasping his hands, regardless of the bread and butter in them. "It is a hard thing to do, but I must have this settled, for I cannot have you watching each other like detectives, and the whole school disturbed in this way. did you put that dollar in the barn this morning?" asked Mr. Bhaer. Dan looked him straight in the face, and answered steadily, "Yes, I did." "I did it; now you may do what you like to me, but I won't say another word about it." "Not even that you are sorry?" asked Mr. Bhaer, troubled by the change in him. "I'll forgive him without asking," said Tommy, feeling that it was harder somehow to see brave Dan disgraced than timid Nat. "Don't want to be forgiven," returned Dan, gruffly. "Perhaps you will when you have thought about it quietly by yourself, I won't tell you now how surprised and disappointed I am, but by and by I will come up and talk to you in your room." "Won't make any difference," said Dan, trying to speak defiantly, but failing as he looked at Mr. Bhaer's sorrowful face; and, taking his words for a dismissal, Dan left the room as if he found it impossible to stay. It would have done him good if he had stayed; for the boys talked the matter over with such sincere regret, and pity, and wonder, it might have touched and won him to ask pardon. No one was glad to find that it was he, not even Nat; for, spite of all his faults, and they were many, every one liked Dan now, because under his rough exterior lay some of the manly virtues which we most admire and love. Mrs. Jo had been the chief prop, as well as cultivator, of Dan; and she took it sadly to heart that her last and most interesting boy had turned out so ill. The theft was bad, but the lying about it, and allowing another to suffer so much from an unjust suspicion was worse; and most discouraging of all was the attempt to restore the money in an underhand way, for it showed not only a want of courage, but a power of deceit that boded ill for the future. Still more trying was his steady refusal to talk of the matter, to ask pardon, or express any remorse. Days passed; and he went about his lessons and his work, silent, grim, and unrepentant. As if taking warning by their treatment of Nat, he asked no sympathy of any one, rejected the advances of the boys, and spent his leisure hours roaming about the fields and woods, trying to find playmates in the birds and beasts, and succeeding better than most boys would have done, because he knew and loved them so well. "If this goes on much longer, I'm afraid he will run away again, for he is too young to stand a life like this," said Mr. Bhaer, quite dejected at the failure of all his efforts. "A little while ago I should have been quite sure that nothing would tempt him away, but now I am ready of any thing, he is so changed," answered poor Mrs. Jo, who mourned over her boy and could not be comforted, because he shunned her more than any one else, and only looked at her with the half-fierce, half-imploring eyes of a wild animal caught in a trap, when she tried to talk to him alone. Nat followed him about like a shadow, and Dan did not repulse him as rudely as he did others, but said, in his blunt way, "You are all right; don't worry about me. I can stand it better than you did." "But I don't like to have you all alone," Nat would say, sorrowfully. "I like it;" and Dan would tramp away, stifling a sigh sometimes, for he was lonely. Passing through the birch grove one day, he came up on several of the boys, who were amusing themselves by climbing up the trees and swinging down again, as they slender elastic stems bent till their tops touched the ground. Dan paused a minute to watch the fun, without offering to join in it, and as he stood there Jack took his turn. He had unfortunately chosen too large a tree; for when he swung off, it only bent a little way, and left him hanging at a dangerous height. "Go back; you can't do it!" called Ned from below. "Catch me! help me! I must drop!" "You'll be killed if you do," cried Ned, frightened out of his wits. "Hold on!" shouted Dan; and up the tree he went, crashing his way along till he nearly reached Jack, whose face looked up at him, full of fear and hope. "You'll both come down," said Ned, dancing with excitement on the slope underneath, while Nat held out his arms, in the wild hope of breaking the fall. "That's what I want; stand from under," answered Dan, coolly; and, as he spoke, his added weight bent the tree many feet nearer the earth. Jack dropped safely; but the birch, lightened of half its load, flew up again so suddenly, that Dan, in the act of swinging round to drop feet foremost, lost his hold and fell heavily. 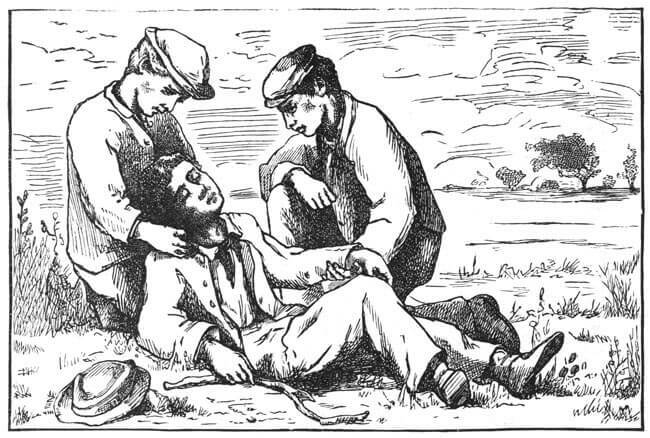 "I'm not hurt, all right in a minute," he said, sitting up, a little pale and dizzy, as the boys gathered round him, full of admiration and alarm. "You're a trump, Dan, and I'm ever so much obliged to you," cried Jack, gratefully. "It wasn't any thing," muttered Dan, rising slowly. "I say it was, and I'll shake hands with you, though you are ," Ned checked the unlucky word on his tongue, and held out his hand, feeling that it was a handsome thing on his part. "But I won't shake hands with a sneak;" and Dan turned his back with a look of scorn, that caused Ned to remember the brook, and retire with undignified haste. "Come home, old chap; I'll give you a lift;" and Nat walked away with him leaving the others to talk over the feat together, to wonder when Dan would "come round," and to wish one and all that Tommy's "confounded money had been in Jericho before it made such a fuss." "I know all about it, and I beg your pardon. It was like you to do it, and I love you for it, though it's never right to tell lies, even for a friend." "What is it?" cried Nat, for Dan said not a word, only lifted up his head, as if a weight of some sort had fallen off his back. "Dan did not take Tommy's money;" and Mr. Bhaer quite shouted it, he was so glad. "Who did?" cried the boys in a chorus. Mr. Bhaer pointed to one empty seat, and every eye followed his finger, yet no one spoke for a minute, they were so surprised. "Jack went home early this morning, but he left this behind him;" and in the silence Mr. Bhaer read the note which he had found tied to his door-handle when he rose. "I took Tommy's dollar. I was peeking in through a crack and saw him put it there. I was afraid to tell before, though I wanted to. I didn't care so much about Nat, but Dan is a trump, and I can't stand it any longer. I never spent the money; it's under the carpet in my room, right behind the washstand. I'm awful sorry. I am going home, and don't think I shall ever come back, so Dan may have my things. "I'll say I'm sorry now, and ask you to forgive me, sir." "It was a kind lie, Dan, and I can't help forgiving it; but you see it did no good," said Mr. Bhaer, with a hand on either shoulder, and a face full of relief and affection. "It kept the boys from plaguing Nat. That's what I did it for. It made him right down miserable. I didn't care so much," explained Dan, as if glad to speak out after his hard silence. "How could you do it? You are always so kind to me," faltered Nat, feeling a strong desire to hug his friend and cry. Two girlish performances, which would have scandalized Dan to the last degree. "It's all right now, old fellow, so don't be a fool," he said, swallowing the lump in his throat, and laughing out as he had not done for weeks. "Does Mrs. Bhaer know?" he asked, eagerly. "Three cheers for Dan!" and there was Mrs. Jo in the doorway waving her dish-towel, and looking as if she wanted to dance a jig for joy, as she used to do when a girl. "Schools are not what they were when I was young!" Dan stood it pretty well for a minute, but the sight of Mrs. Jo's delight upset him, and he suddenly bolted across the hall into the parlor, whither she instantly followed, and neither were seen for half an hour. Mr. Bhaer found it very difficult to calm his excited flock; and, seeing that lessons were an impossibility for a time, he caught their attention by telling them the fine old story of the friends whose fidelity to one another has made their names immortal. The lads listened and remembered, for just then their hearts were touched by the loyalty of a humbler pair of friends. The lie was wrong, but the love that prompted it and the courage that bore in silence the disgrace which belonged to another, made Dan a hero in their eyes. Honesty and honor had a new meaning now; a good name was more precious than gold; for once lost money could not buy it back; and faith in one another made life smooth and happy as nothing else could do. Tommy proudly restored the name of the firm; Nat was devoted to Dan; and all the boys tried to atone to both for former suspicion and neglect. Mrs. Jo rejoiced over her flock, and Mr. Bhaer was never tired of telling the story of his young Damon and Pythias.